Image collections allow you to have a large set of different fragments of images and insert them into edited frames. You can use collections supplied with the program or create your own collections. To set collections use menu item Tools / Image Collections. You will see the dialog box with a list. Elements of the list are file names with the bitmap strips. You can add and delete items, sort list and check / uncheck marks in the list items. The checked item means: window with appropriate set of images is visible on screen now. You can move this window with images and change its size. 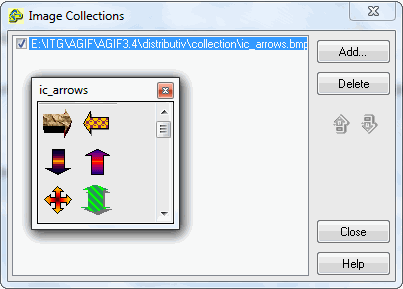 Select tab Edit in Image area and click on any image in the window with a collection. Image will be inserted into the left upper angle of the current frame (similarly to operation Edit / Paste). Move it to desired place and continue editing. pasted image is not transparent.